The level of dental caries in deciduous (baby) teeth in developed countries remains high -- 20.5% in children ages 2 to 5 years in the US and 25% in children aged 3 years in Japan. While established methods for caries prevention in young children is limited to sugar restriction, oral fluoride supplementation and fluoride varnish, some studies have suggested associations between secondhand smoke and caries. 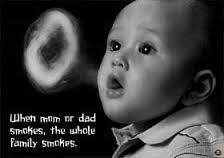 But it is still uncertain whether reducing secondhand smoke among children would contribute to caries prevention. So a team of researchers based in Japan set out to investigate smoking during pregnancy and exposure to household smoke in infants at four months of age as risk factors for caries in deciduous teeth. They analysed data for 76,920 children born between 2004 and 2010 attending routine health checkups at 0,4,9, and 18 months and at 3 years of age at health care centres in Kobe City, Japan. Questionnaires completed by mothers were used to assess secondhand smoke exposure from pregnancy to 3 years of age and other lifestyle factors, such as dietary habits and oral care. Incidence of caries in deciduous teeth was defined as at least one decayed, missing, or filled tooth assessed by qualified dentists. Prevalence of household smoking among children included in the study was 55.3%, and 6.8% had evidence of tobacco exposure. A total of 12,729 incidents of dental caries were identified, mostly decayed teeth. Compared with having no smoker in the family, exposure to tobacco smoke at 4 months of age was associated with an approximately twofold increased risk of caries. The risk of caries was also increased among those exposed to household smoking, by 1.5-fold, whereas the effect of maternal smoking during pregnancy was not statistically significant. This is an observational study so no definitive conclusions can be drawn about cause and effect, stress the authors, and results may have been influenced by other unmeasured factors. However, they conclude: "Exposure to secondhand smoke at 4 months of age, which is experienced by half of all children of that age in Kobe City, Japan, is associated with an increased risk of caries in deciduous teeth. Although these findings cannot establish causality, they support extending public health and clinical interventions to reduce secondhand smoke."